Over eight boxes, totalling over 400 lbs of unwanted medicine, were collected in April. 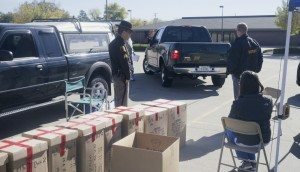 After collecting a whopping 400 lbs of unwanted, unused, and expired medications at the April Prescription Take-Back, the Buffalo County Sherriff’s Office is set to have a record-breaking year of prescription collections. The next Take-Back event is scheduled for Saturday, September 27, from 10 a.m. to 2 p.m. at Good Samaritan Hospital in the north parking lot. Volunteers from Positive Pressure, Good Samaritan Hospital, Kearney/Holdredge Elks Lodge #984, and Two Rivers Public Health Department will be assisting the Sherriff’s Office in collecting medications dropped off by community members. Drop-offs are free and anonymous, and a great way to safely rid your medicine cabinets of old and unwanted medication. According to a study from Monitoring the Future, prescription medications are the second-most abused drug in America. In addition, 70% of prescription abusers got them from a friend or relative, while only 5% got them from a drug dealer or over the internet. These numbers show why it is so important to rid your medicine cabinets of expired or unwanted prescriptions. Join us September 27 and safely dispose of your old medicine. For more information, including a map and directions to the event, visit positivepressure.org/rxtakeback.